One university student, Kate Sheka, said her initial visit to Michigan State University in East Lansing included a full campus tour and meetings with her future adviser. She also met with other high school students visiting Michigan State. “My advice for future students would be to do a lot of research before you choose a few colleges to apply to and then to visit,” Sheka said in an email. Ms. Weinberger noted that there are many higher education institutions in the Chicago area high school students could visit, such as the University of Illinois at Chicago. The first college I visited was Northern Illinois University in DeKalb, Illinois. But as someone who wants to be a journalist, I was disappointed because I didn’t get to learn about the school’s journalism program. While it was helpful to hear the students say it was important to set a flexible schedule and get other advice from them, I wanted more focus on media opportunities. My trip to Michigan State, on the other hand, allowed me to see the resources a student journalist there could take advantage of. For example, Jim Detjen, who is a journalism professor specializing in environmental issues, showed our group from Englewood the journalism department. We also were able to see a television station called WKAR. Station manager Gary Reid gave us a first-hand look at the station’s studios where political talk shows and a high school quiz program are taped. Finally, Kate Jacobson, the editor in chief of the student newspaper the State News, spoke to us about her experience as a reporter at the school. 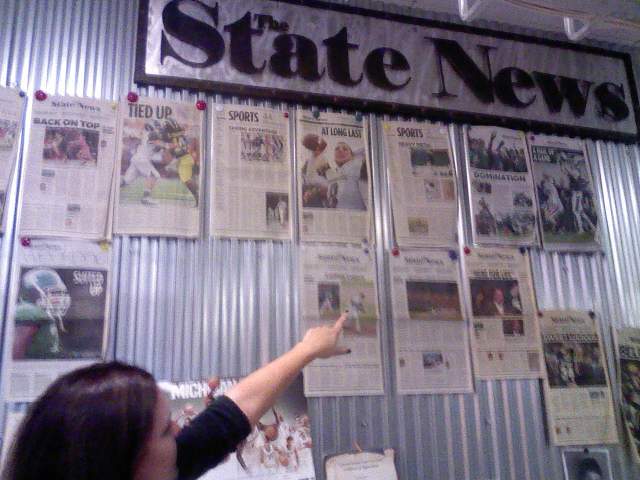 We saw exactly where a Michigan State reporter covering everything from crime to campus news to sports would sit, do interviews, and write their articles in the State News building. As someone who has gone on multiple college tours, I would advise that students do research about the campus before visiting. Try to figure out what you want before you visit and make sure you seek that out once you are on your tour. This entry was posted	on Thursday, April 26th, 2012 at 11:51 pm. You can follow any responses to this entry through the RSS 2.0 feed. You can leave a response, or trackback from your own site.